Leaving your prawns to rest, move on to preparing the rest of your salad. First, peel and matchstick the green mango, placing the finished slices into a large mixing bowl. Next, matchstick your spring onion by first removing the root and chopping the whole onion into thirds, before then finely slicing each section into thin pieces. Place the chopped spring onion into the large mixing bowl along with the mango, then pick a handful of mint leaves and finely slice them with a large knife, adding the small pieces to the mixing bowl too. Now, bring your bunch of coriander to your chopping board. Pick half of the leaves and sprinkle them, whole, into the mixing bowl. Use a large knife to finely chop the remaining coriander, including the stalks, and place it into a large ramekin to be used in your Nuoc Cham Dressing. For the rest of the dressing, finely chop the red chilli and garlic and add them to the ramekin along with the lime juice and palm sugar. Mix the ingredients together with a spoon, making sure to crush and dissolve all of the palm sugar, before finally adding the fish sauce one tablespoon at a time, according to taste. 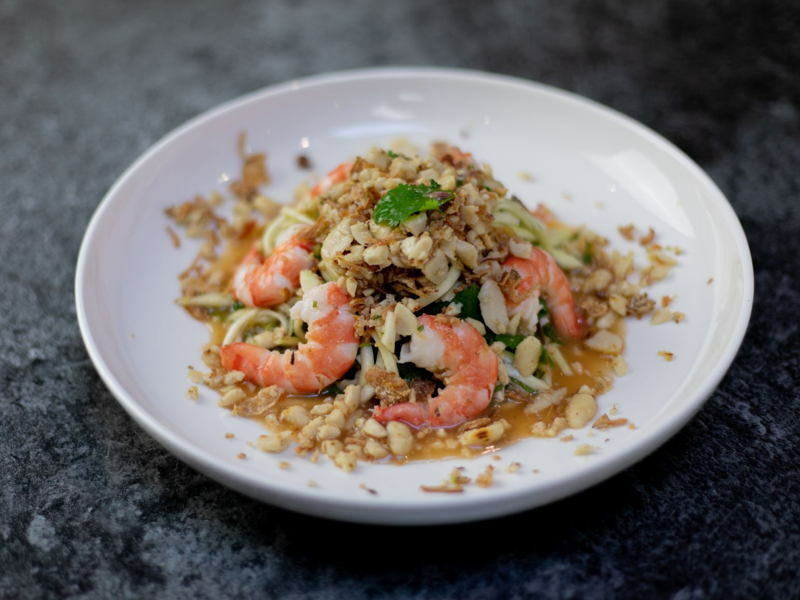 At this point, pour your Nuoc Cham dressing over the salad little by little, tossing to combine and taste. (Hint: make sure you don’t overdress the salad and therefore overpower the other flavours and textures! Leftover dressing can be served alongside the salad in a small jug or ramekin, for guests to add as they wish). Lastly, remove the prawns from the cold water and peel. Transfer the salad into a serving bowl or plate, arranging the peeled prawns around the edge, and top with a garnish of crushed, roasted peanuts, fried shallots, and a pinch of sea salt, if using. Serve, and enjoy!